Linoleum is an “old school” term for a type of flooring that is currently marketed as Marmoleum Flooring. Marmoleum Flooring is manufactured by Forbo Flooring and is sold locally by Tigard’s Trusted Flooring Source, Portland Flooring & Carpet of Tigard. Portland Flooring & Carpet of Tigard has been serving the Tigard, Oregon area for over 18 years, and is proud to offer linoleum flooring to Tigard homeowners. In Tigard, Linoleum is an extremely popular choice for Tigard homeowners concerned with durability and being eco-friendly. Linoleum is eco-friendly flooring because of what it is made of. Linoleum is made primarily from the all natural ingredients of wood flour, linseed oil, Rosin, jute and ground natural limestone. In addition to its ingredients, Linoleum is “green” because of its durability. Commonly called the “40 year floor,” Linoleum is very durable. Marmoleum, along with bamboo, is one of our most in-demand types of green flooring. High quality Linoleum floors are extremely durable because of how they are created. These floors are created by joining and inlaying solid pieces of linoleum and are known as “inlaid.” Alternatively, we can provide more affordable patterned Linoleums. These are equally eco-friendly but are manufactured differently. As a type of the old style linoleum, as stated earlier Marmoleum is made of limestone, cord dust, recycled wood flooring, and linseed oil. These natural materials are truly what makes the floor so eco-friendly. Linoleum is also naturally anti-static and anti-bacterial. In Portland, Marmoleum floors are more easily kept clean than other types of flooring. Specifically, antimicrobial substances kill or inhibit the growth of microorganisms like bacteria. As a result, Linoleum floors are kid-friendly. Fewer bacteria on your floor is always a good thing, especially for kids. Similarly, in Tigard, Linoleum floors are ideal for allergies and respiratory disorders. Because Linoleum floors are anti-bacterial, the floor is unlikely to collect substances that may affect people with these health factors. Beyond that, because Linoleum is anti-static flooring, unlike carpet, children – or anyone – can run around on Linoleum flooring without having to worry about getting shocked. Further, Linoleum comes in a wide array of colors. Portland Flooring & Carpet in Tigard, serving Tigard can provide you with varying Linoleum colors, from bright greens to neutral colors. Checkerboards, stripes, and much more can be integrated into your home for stunning visual effect. In addition to the sheet product sold by the yard, Marmoleum is available as 13″x13″ or 20″x20″ glue-down tiles or as a click product allowing easy, adhesive-free installation over a variety of subfloors. For the tiles, the linoleum is adhered to a polyester backing. The click product consists of linoleum over a layer of high-density fiberboard (HDF) with a cork underlayment. In Tigard, Linoleum flooring is also a great fit for bathrooms and kitchen, primarily because it is anti-bacterial. The benefit here is that mold won’t grow and germs won’t spread in your kitchen. 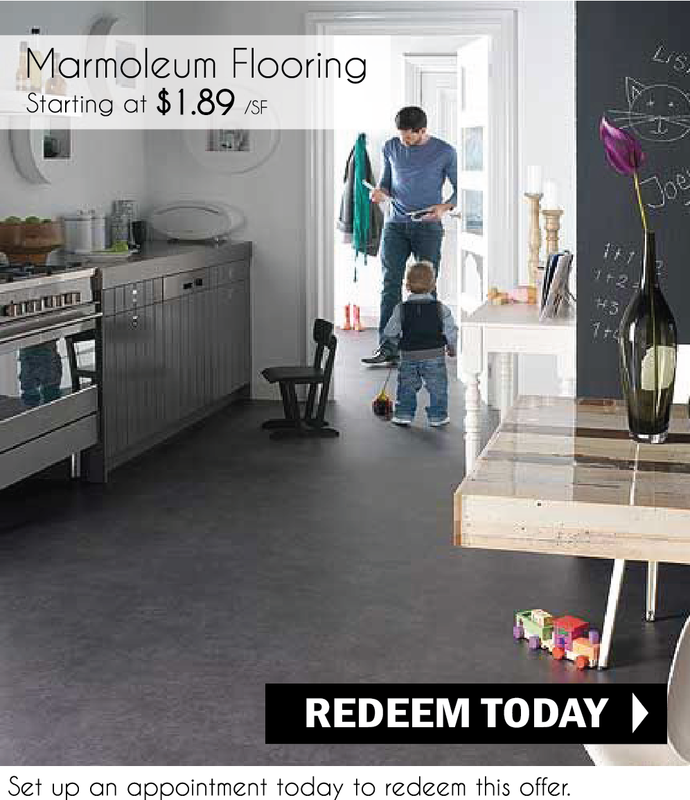 At Portland Flooring & Carpet of Tigard we have in stock rolls of Marmoleum starting at just $1.89 sq ft. Call Portland Flooring & Carpet of Tigard, serving Tigard today to schedule a free in-home consultation. We will review all of the benefits of Linoleum and all our other flooring choices – and provide you with free design assistance and estimates. Either Call (503) 388-6070 or complete our online form to schedule a complimentary in home estimate and design consultation.